Colorful and plentiful blooms all summer long until the frosts of autumn. Zinnias are just way too easy to grow—they demand very little and they give back a lot with just a minimum of effort on your part. Plant your zinnias in an area of the garden that will receive full sunlight. That’s pretty much the most important requirement for them to thrive and reward you with lots of brilliant blooms. Zinnia plants are often available in your local garden center and can be transplanted directly into the garden provided all danger of frost has past. The plants also work well in containers on your deck, patio, or porch if the shorter varieties are used. Or pinch the plants back to encourage more side growth and bushiness rather than height. Again, full sun is imperative for maximum bloom production. 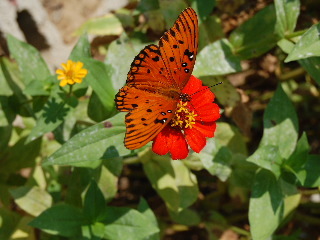 More often, zinnias are grown from seeds planted directly into the garden soil. They establish quickly and are tough little plants once they get up out of the soil. Add organic amendments to your garden plot if the soil is lacking looseness and fertility. And, although the zinnias will gush with grandeur in rich soil, they won’t hold back the blooms even in mediocre soil provided adequate moisture and plentiful sunshine are present. Zinnias are available in a variety of colors from brilliant shades of red, orange, yellow, and purple to more subtle shades of pink, green, and white. The blooms are also available in single or double-flowered blossoms. In the single flowered zinnias, a single row of petals surrounds and reveals the center of the flower, giving this kind of zinnia a more “old-fashioned” simple appearance. The double-flowered zinnias are fuller and thicker, with an appearance more like the blossoms of carnations or chrysanthemums, the centers being smaller and more hidden in the bolder profusion of petals. Zinnias work well planted in clusters or mixed in with other types of flowers in your garden, thus allowing for a mixture of plant textures, sizes, and colors. 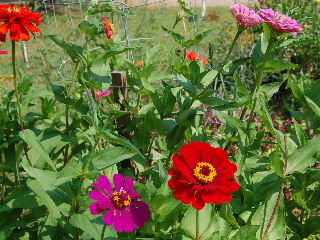 Zinnias are also desirable companion plants when added to your vegetable garden. The colorful blooms attract desirable insects, in addition to butterflies and hummingbirds. Plant lots of zinnias to add color to your garden all summer long, or cut them to bring into the house for a tabletop bouquet or to share with others.